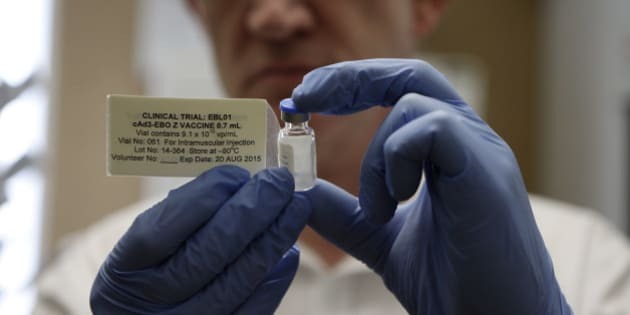 TORONTO - Canada is considering placing doses of an experimental Ebola vaccine in hospitals around the country that have been designated to treat Ebola cases if any arrive in the country, the new chief public health officer said Wednesday. Dr. Gregory Taylor said having vaccine at the ready means it could be used if health-care workers treating Ebola patients had risky exposures. "We're considering prepositioning some of that at receiving hospitals across the country who may be looking after Ebola patients. This is for the health-care workers," Taylor said during a news conference held in Banff, Alta., where the federal, provincial and territorial health ministers met Wednesday. Taylor said that includes the Ontario hospital that has been designated to care for Canadian responders if any become infected in the Ebola zone and are transferred back to Canada for care. He did not mention the hospital by name, but it is Toronto Western. To date, that need has not arisen. The vaccine, created by researchers at Canada's National Microbiology Laboratory in Winnipeg, is still experimental. But in animal testing it has been shown to both protect primates from contracting Ebola if it is given before they are exposed to the virus and prevent death, if exposed animals receive it quickly after exposure. Taylor and Federal Health Minister Rona Ambrose met with the media Wednesday to address concerns raised by Tuesday's announcement that a Dallas hospital had diagnosed Ebola in a man who recently travelled to Texas from Liberia, one of the hardest hit countries in the West African outbreak. Ambrose insisted Canada's risk from the virus is low. "We have strong measures in place to protect Canadians," she said, noting the Canadian Border Services Agency has stepped up screening of passengers entering Canada from affected countries. In reality, that offers imperfect protection. Ebola has a long incubation period — the time from exposure to when an infected individual develops symptoms. While it is rarely the case, the incubation period can be as long as 21 days. Symptoms more typically start to develop within eight to 10 days after exposure. That leaves plenty of time for someone to contract the virus and travel across the globe while still appearing to be perfectly healthy. Quarantine officers might detect people who are starting to show symptoms — which is when Ebola cases become contagious — but an exposed person who hasn't yet developed symptoms would look like any other traveller. Still, Canada's current risk is still likely low because few people from the three affected countries travel here, said Dr. Kamran Khan, a Toronto-based infectious diseases expert who uses global flight data to predict spread of diseases. Khan said only about 1.5 per cent of travellers leaving the three countries — Guinea, Sierra Leone and Liberia — come to Canada, and about half of them travel to Quebec. But Khan warned that if the outbreak spreads to other parts of Africa or the world, the mathematics of risk will shift for Canada and other countries that currently reassure themselves that the problem is a distant one. "When people ask 'Is this likely to spread?' I think the answer really is it depends on how long this epidemic persists and the magnitude and scale of the epidemic," said Khan, who practises at St. Michael's Hospital. "So it's really just an issue of the larger that it is, the more that it goes unchecked or that it grows, and the longer it persists the likelihood of it showing up in other places starts to increase." Taylor and others in public health say Canada has been preparing for that risk for months, by beefing up the country's ability to respond should a case be imported to Canada. Provincial laboratories are working to develop the ability to test for Ebola, with Quebec's facility already capable of doing so, Taylor says. Provincial labs in Ontario, British Columbia, Alberta and Nova Scotia will soon be able to test for the virus as well, he says. "They can rule out Ebola very, very quickly," Taylor says. "And if they get a preliminary positive they will ship that to our laboratory (in Winnipeg) and we will do a definite positive to be absolutely certain. And that's part of the preparedness in case somebody does get through, comes to Canada with Ebola." Hospitals have been alerted to be on the lookout for possible cases among people who have travelled to West Africa. Guidelines for care of potential and confirmed patients have been drawn up both for hospitals and for family physicians. "There is an extremely low risk, but not a zero risk that we could get a case in Canada. ... So yeah, since March we've been working on materials, guidance, tools, messages for the health sector in Ontario to be prepared and vigilant to be able to suspect cases, detect them when they come and ensure that health-care workers are protected when they do identify a potential case," said Dr. Brian Schwartz, chief of emergency preparedness for Public Health Ontario. Schwartz said the provincial agency has also held webinars for family doctors on the issue. The Ebola epidemic is the largest in known history, more than 10 times bigger, in fact, than the largest previous outbreak. The World Health Organization's latest figures — released Wednesday — suggest at least 7,178 people have been infected with the virus and nearly 3,338 have died. Before this outbreak, the largest outbreak of Ebola involved fewer than 450 cases. The aid group Medecins Sans Frontieres, which traditionally has run all the treatment facilities during Ebola outbreaks, long ago said it can't manage this one on its own. It has been begging for help from other aid organizations and has even called for military hospitals to be deployed — something the group considered anathema in the past. Ambrose said Canada's Disaster Assistance Response Team — known by the acronym DART — will not be going to West Africa to help with this outbreak. The DART is useful in response to natural disasters but does not have the capacity to respond to viral outbreaks, she said. She did say Canada is trying to make it easier for Canadian doctors to volunteer to join outbreak responses, though she did not elaborate on the steps being taken. "We are hoping to see more Canadian physicians be able to go over," said the minister, who thanked those who have gone or are currently working on the response. "But importantly, we want to make sure that that's done in a co-ordinated fashion so we are working with provinces and territories and other organizations to make sure that people who do go over are safe."